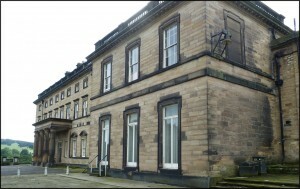 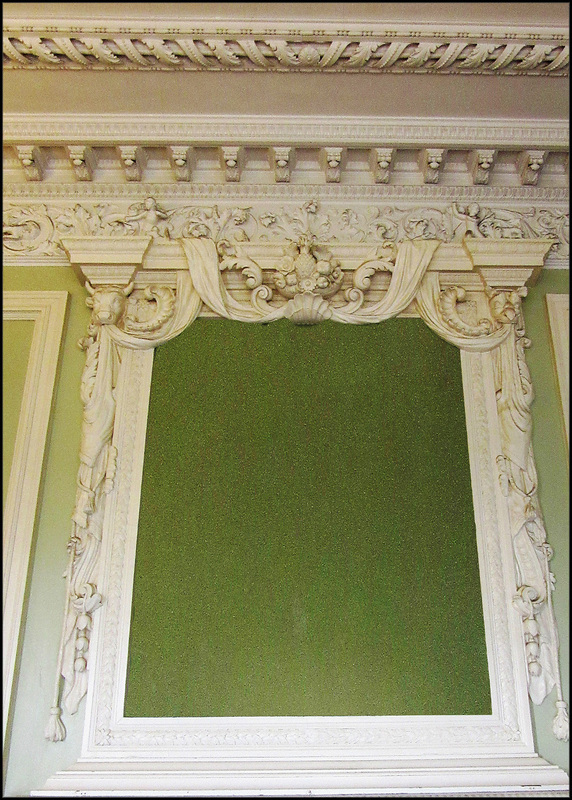 When Jeffry Wyatt’s newly-designed Dining Room was built (c.1814), the original dining room, situated in the north-east corner of Sir William Wentworth’s mansion, was renamed the Breakfast Room. 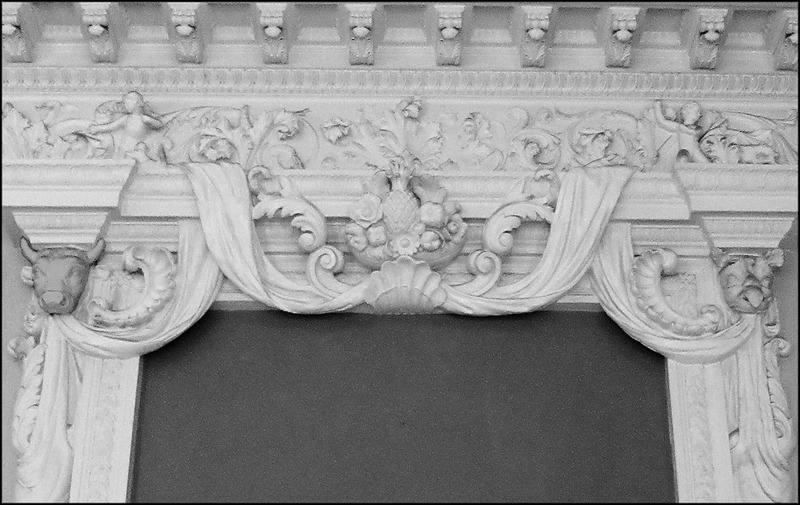 The exterior of Wyatt’s new structure was embellished with a rather splendid bow on its east face. 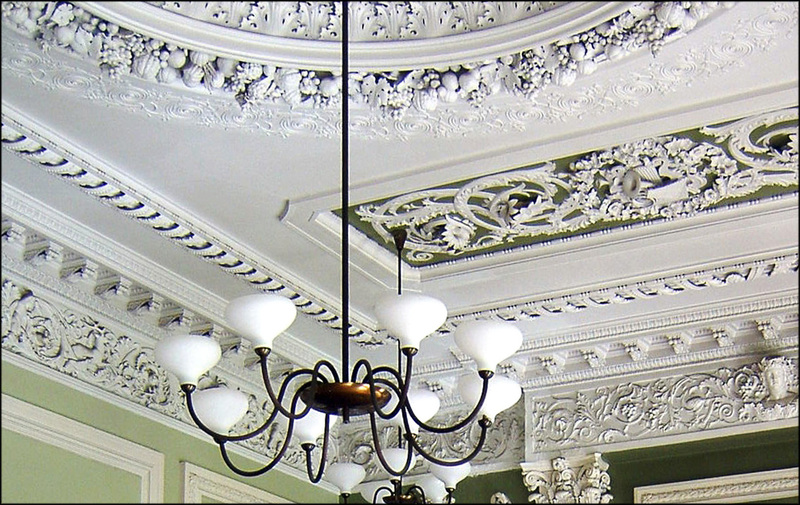 This dining room, however, lasted for fewer than 20 years. 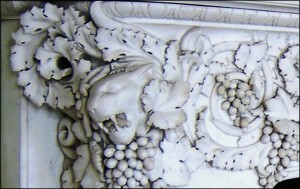 In the early 1830s, George Basevi Jnr. 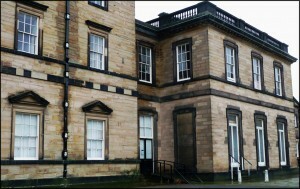 produced a plan for his proposed developments, which included a new dining room, to be built on the site of Wyatt’s grandiose structure. 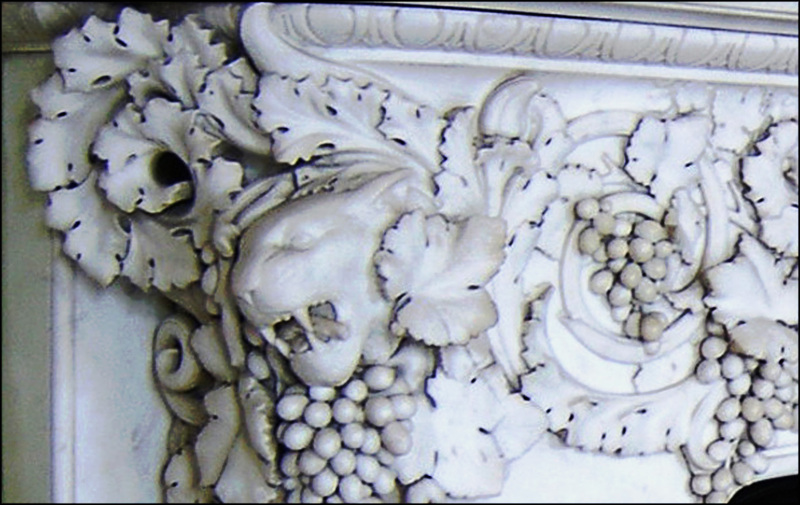 Basevi’s dining room is the one that exists today. 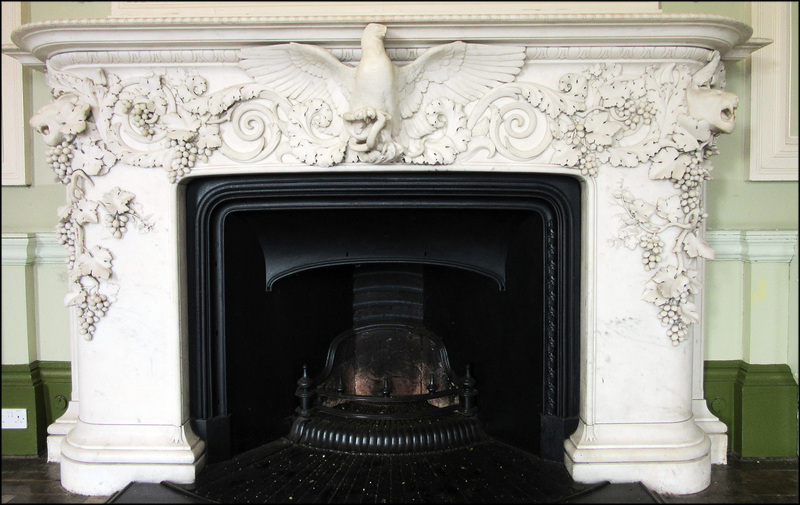 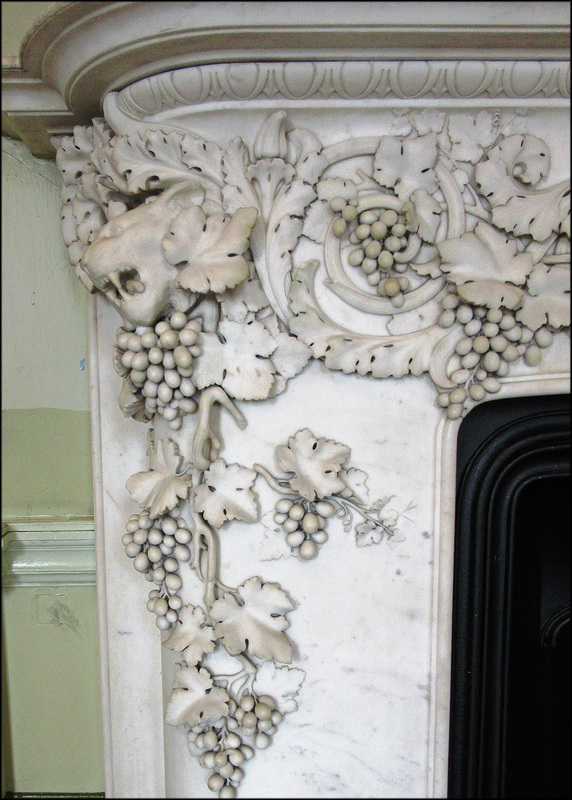 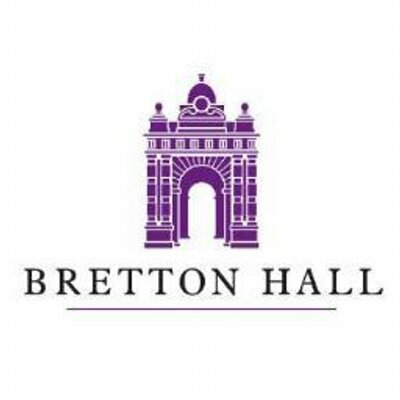 In 1841 Basevi arranged for the purchase of a monumental marble fireplace, weighing three tons, to be transferred from London to Bretton for installation in the new Dining Room. 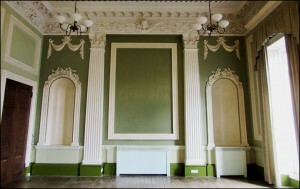 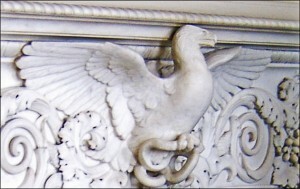 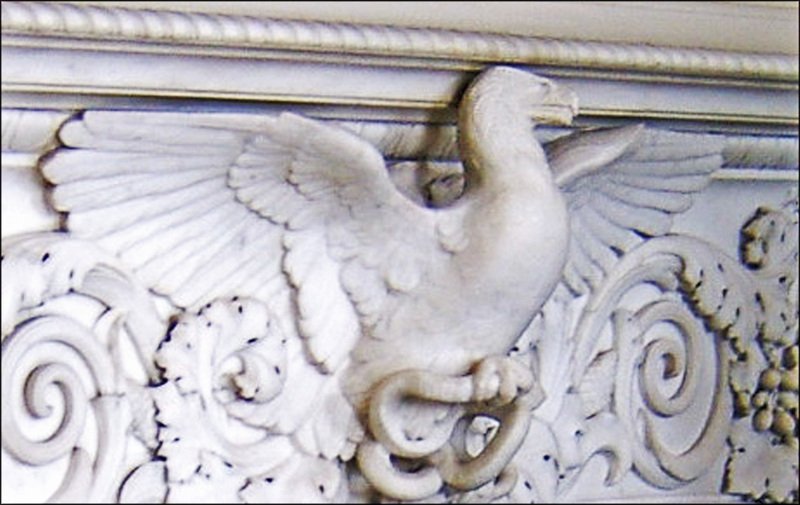 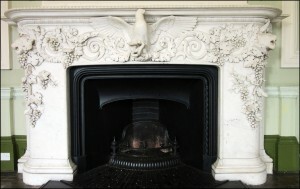 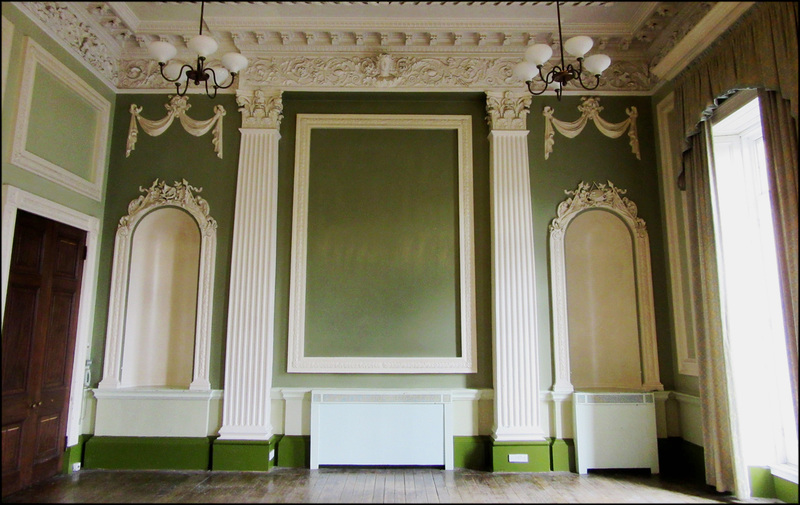 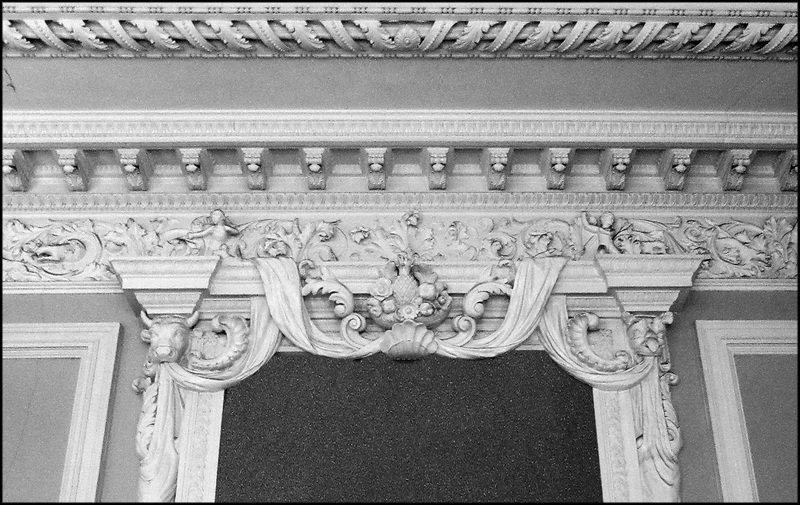 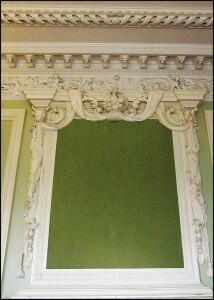 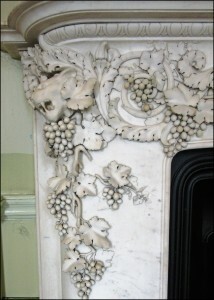 This is one of the few chimneypieces not to have been removed when Bretton Hall was sold in 1948. 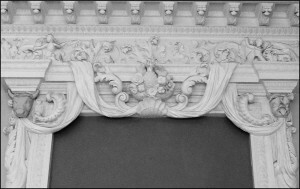 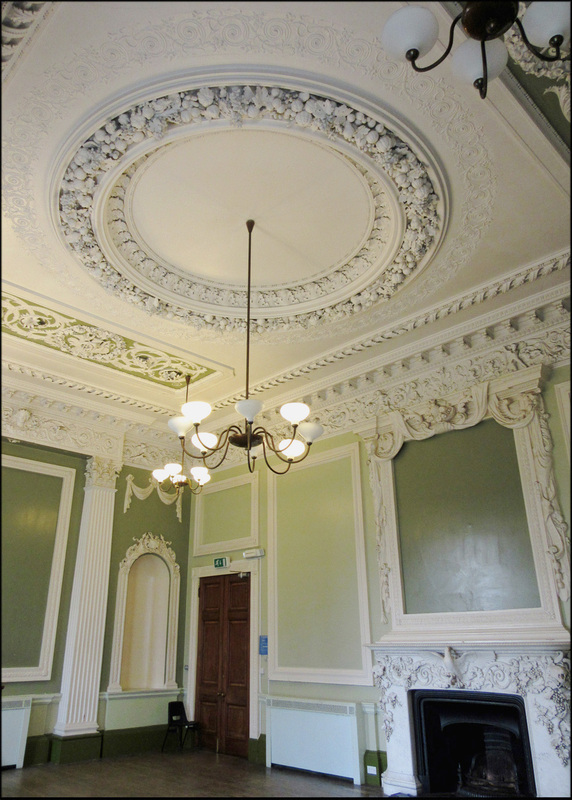 About 1852, Basevi’s original internal decoration of the Dining Room was replaced by more exuberant Victorian work, in the Rococo style, with north and south walls decorated with plaster pilasters and niches. 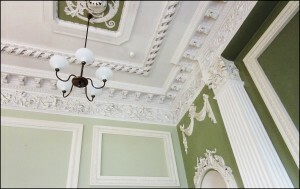 The architectural qualities of the design are emphasised by contrasting white with a dark green background. 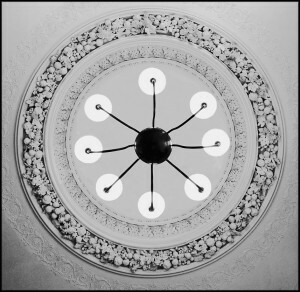 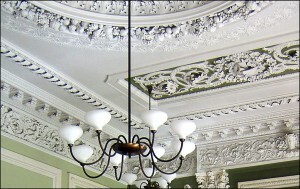 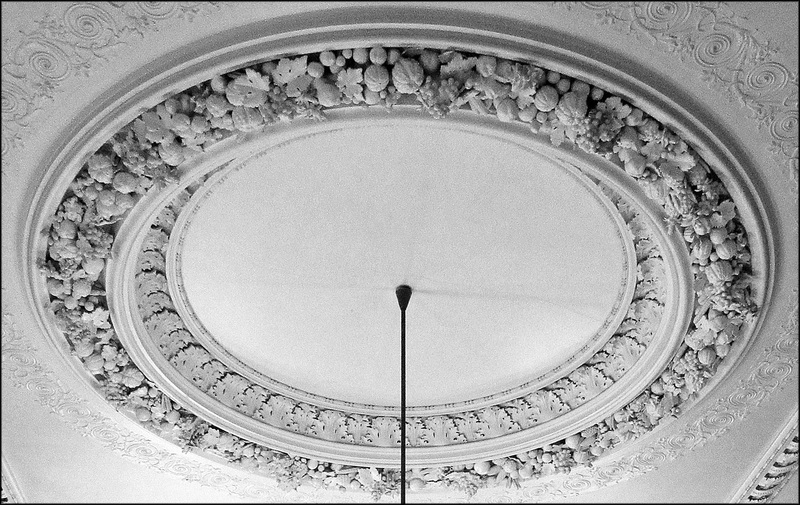 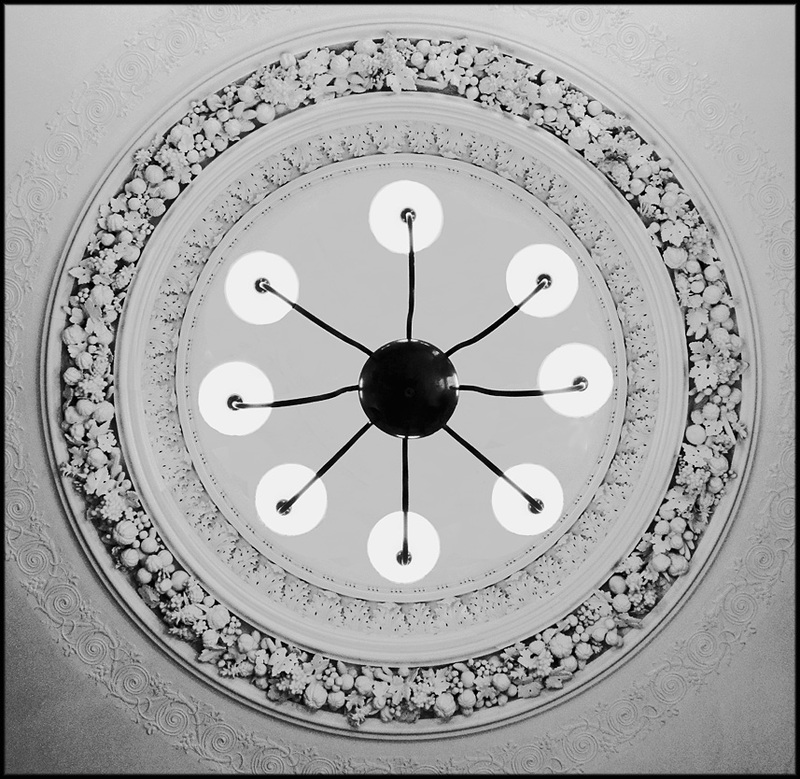 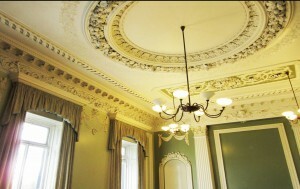 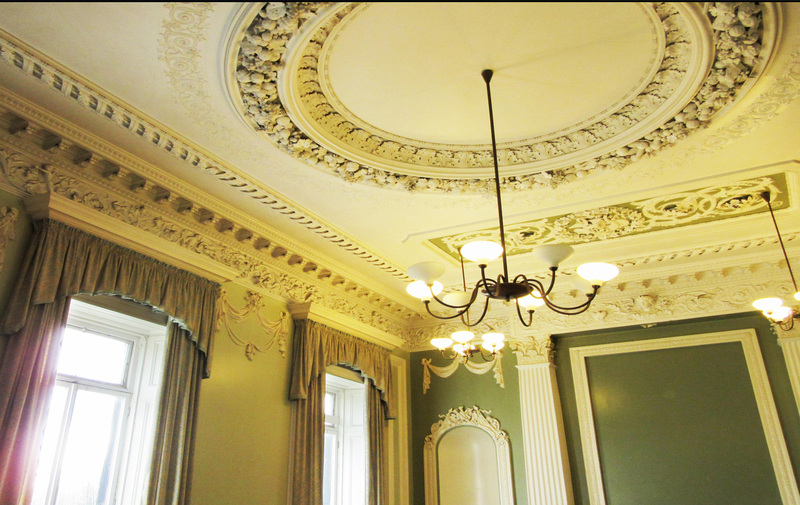 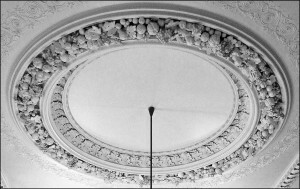 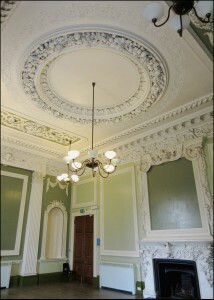 The plasterwork on the ceiling is remarkable in its realistic representation of fruit and musical instruments.